If you've gotten to this page, you've probably noticed that I've updated my whole blog template! I loved the pink stripes, but let's be honest... it was a little bit boring. It was what I chose quickly when I started out on Blogger. 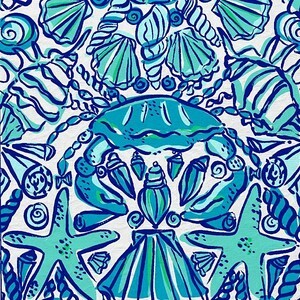 My background is a Lilly Pulitzer print, but I cannot find the name anywhere! Honestly, there were SO MANY prints to choose from: there are only a few prints that I'm not in love with. My Lilly obsession is insane. I'm going to test it out for a while, but if you have any ideas or know the name, let me know by commenting! Speaking of Lilly, I'll be posting a (late) blog post about the new summer collection- I turn into goo whenever I look through it. Ugh, I'm already worried for the end-of-summer sale, it's all just SO freaking cute!